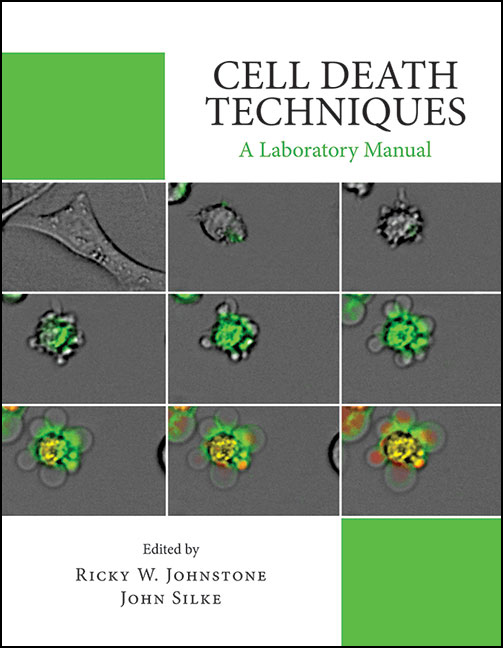 Cell Death Techniques: A Laboratory Manual, published by Cold Spring Harbor Laboratory Press, provides a comprehensive suite of step-by-step protocols for inducing, detecting, visualizing, characterizing, and quantifying cell death in a variety of systems. The contributors describe strategies for identifying and evaluating the biochemical and morphological changes that occur during apoptosis, autophagy, necrosis, and other forms of cell death, as well as for pinpointing the genes and proteins that may be involved. The protocols employ flow cytometry, imaging and microscopy, RNAi, western blotting, enzymatic activity measurements, and other tools to assess phenomena such as DNA fragmentation, lysosomal membrane permeabilization, autophagic flux, apoptosome or ripoptosome formation, caspase activation, and cytochrome c release. Techniques are described for both in vitro systems and in vivo models, including mice, C. elegans, and Drosophila. IMAGE: Time-lapse images show a tumor cell undergoing apoptosis after exposure to perforin and granzyme b (top left, 5 min after exposure; bottom right, 4h after exposure). CREDIT:Image courtesy of Nigel Waterhouse, Jane Oliaro, Phil Bird, and Joe Trapani.